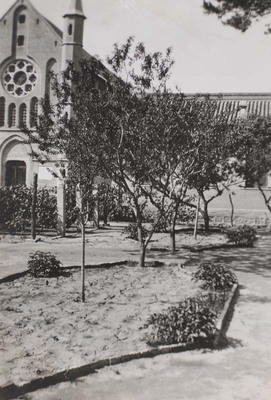 Monastery of Yangjiaping: garden and chapel built by missionary-architect Alphonse de Moerloose. Monastery of Yangjiaping garden. July 5, 1931. Société des Auxiliaires des Missions (SAM) China Photograph Collection, Whitworth University Library, Spokane.